Folks interested in life on other worlds have focused most of their attention on Mars lately. 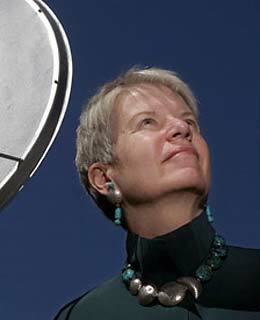 But Jill Tarter makes it her business to pay attention to what's going on in the other 100 billion galaxies that fill the observable sky. Tarter is director of the center for research at SETI (Search for Extraterrestrial Intelligence) Institute in Mountain View, Calif., where her job is to keep her ears open. The universe fairly roars with electromagnetic noise, most of which flows in randomly. If any arrived in regular pulses, it would be a good bet that something smart was doing the sending. Tarter has been listening for such cosmic drumbeats for a while. She joined the ET hunt in graduate school at the University of California, Berkeley, where she used the school's 85-ft. telescope to search for alien signals. She later became a scientist for NASA's High Resolution Microwave Survey, which conducted similar research. This experience has led her to bring imagination to her work. With the help of a $25 million endowment from Microsoft co-founder Paul Allen, she and the other SETI scientists are developing a new telescope array  a collection of up to 350 steerable dish antennas, electronically combined to do the work of a far bigger 115-meter antenna. An even more powerful dish array is being planned. The odds of finding anything are long and the universe that Tarter's team is scanning is big, but they're willing to be the ones who listen for a whisper.